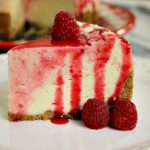 If you are looking for an amazing dessert recipe that you can make in your slow cooker this recipe for Crock-Pot Cheesecake is a winner every single time! It is hard to believe that you can cook a cheesecake…a CHEESECAKE in your slow cooker but you sure can! The key to cooking this cheesecake in your slow cooker is having a small bowl or springform pan that will fit inside of your crock. This allows you to easily remove your cheesecake from the slow cooker as well as lets you cook your cheesecake in a water bath. In this recipe I rummaged around in my kitchen cupboards for a heat safe bowl that would fit inside of my 6 quart oval crock-pot and found one. If you do not have a bowl already this 7 Cup Pyrex Glass Bowl should work in most slow cookers. You could also use a small springform pan that you have wrapped the bottom in aluminum foil before adding to the slow cooker. Adding water around your cheesecake while it cooks allows for plenty of moisture and prevents your cheesecake from cracking. Once the cheesecake is done cooking allow it to cool to room temperature and then chill it in the refrigerator for several hours. When you are ready to serve just carefully remove the cheesecake from the pan and eat as is or you can top with anything your heart desires. In the photos for this recipe I used a raspberry sauce that I made (fresh raspberries and a little sugar cooked on a pan on the stove top until the berries were juicy. I smashed the berries while they cooked with a spoon. Strained off the pulp and seeds and let it cool) and of course a few fresh raspberries for garnish. But feel free to use canned pie filling (cherry is classic), chocolate sauce, caramel, melted Nutella…the options are endless! Using a mixer, in a large mixing bowl mix together the cream cheese and granulated sugar until well combined. Add the three eggs to the cream cheese mixture one at a time, mixing well after each egg is added before adding the next egg. Mix in the pure vanilla extract and set cheese mixture aside while you prepare the crust. In a separate bowl mix together the graham cracker crumbs and melted butter with a fork until the mixture resembles damp sand. Add the graham cracker crumb crust mixture to the bottom of a small heat proof bowl or small springform pan that will fit inside your 6 quart or larger slow cooker. With a spoon or the back of a dry measuring cup press the graham crackers into the bowl or pan until you have a smooth flat layer of crust. Spoon the cream cheese mixture over the top of the crust and spread it around to make a smooth layer. Place the cheesecake inside your slow cooker and using a liquid measuring cup or tea kettle with a spout carefully add 2 to 3 cups of water in the space between the cheesecake and the crock-pot insert making sure not to get any water on the cheesecake itself. The water level should reach half way up the side of your cheesecake. Cover slow cooker and cook on high for 2 hours or 2 1/2 hours or until the center of the cheesecake is no longer watery when you stick a thin knife into the center of it. Turn the crock-pot off and leaving the lid off let the cheesecake cool in the crock-pot for 30 minutes to 1 hour. Carefully remove the cheesecake from the slow cooker and cover with foil or plastic wrap and place in the refrigerator for at least 1 hour to chill before eating. Serve cheesecake plain or with your favorite fruit topping if desired. I am loving your recipes! I would love for you to guest post on my blog about some of your favorite crockpot desserts, so let me know if you would be interested! Thank you so much for linking up to the Recipe Party @ The Sweet Spot. I hope to see more great recipes from your blog next week! Hmmm, Im really liking this idea! Perfect for hot weather months when I want a cool cheesecake, but don’t want to use the oven to overheat my house! That is one of the nice things about the crock-pot, your house does not get heated up! Just filled that dish with water to get a good idea…it is a 1.5 quart dish (filled to the brim). The inner pot is it the one you put the cheesecake in or the water? Sorry little confused. think of a floatie in a pool. the floatie doesnt have water in it, but the pool does. so you want the water in the crock-pot and the cheesecake in a pan sitting in that water. hope that helps a little bit more. Cheesecake is a funny animal. It is the one food that you can easily ruin with one beat too many on an egg, or adding an ingredient wrong. I think (stress the think part) you can use a sugar substitute. But i recommend eating just a smaller portion. having had gestational diabetes twice and a strong love for cheesecake, that is what I had to do. Thanks Sherry for letting us know that Splenda works in this recipe! can you use low fat cream cheese (or even fat free) in this? Yes you should be able to. I have used the low fat/fat free one before in other recipes and the flavor is all the same. I have one quick question. What kind of pan did you use? I have a spring form pan that I usually use for cheesecakes. Will that work? You should be able to use the spring form pan, as long as it will fit in the crock itself. I used a “crock” type pan (it is an old one that has a lid to it) and I also used a regular old baking pan (non stick rectangle one) for a pumpkin cheesecake (recipe is coming!!). If you are concerned about marks being left on the bottom of the crock-pot itself, put in a small trivet or a rack. Then put your pan on top. I will say that I have yet to have any marks left on my crock-pot. Yes! Foil will help keep it off the bottom also. Also – I have used aluminum or other metal in a crock pot. For example, cans of sweetened condensed milk. They can leave rust marks in the bottom of your crock – So I lay down a clean but old kitchen cloth to prevent metal rings on the bottom of my white pot. a springform pan would probably let water seep in. Most don’t have a seal or a gasket, so if you place it in water I think it would totally ruin your crust if not the whole cake. Definately should not use one of the springform pans. You need something solid. That’s why the recipe instructs you to double wrap the spring form pan with aluminum foil. . .to stop the water from seeping into the pan and ruining the cheesecake. You might need to wrap the out side of a spring form w/foil to keep the water out. what about condensation from the lid? did water drop on top and if so was it a problem? still going to try this, love love cheesecake. Yes there was condensation on the lid. And it probably did drip into the mixture, but it was not enough to dilute the recipe. When I was checking the cheesecake, I could see a little puddle of water in the middle of the cheesecake. I am sure this is what it was from, but that dried up as the cheesecake cooked. The biggest think is making sure you dont put too much water in that it gets into your pan, but yet you need to make sure there is water in there as it cooks. I used just over 2 cups and that lasted just fine. I also used a 6 qt oval crock pot. Someone gave me this bit of advice about lifting crock pot lids. Or, for lifting lids inside the crock pot like this recipe. Keep the lid straight and lift upwards without tilting. It’s the tilting of the lid that allows the condensation to run into the food. I make a dynamite ricotta cheese/panatone bread pudding that I cook in the crockpot and I am careful in lifting the top of the inside top. If there is a lot of condensation, I take the top off and wipe it dry. Maybe I shouldn’t do that but I feel that it’s worth it. Hi, can u share your ricotta slow cooker bread recipe with us ? There is no mention of temperature. Which setting do you use on the crock? Thank you! Oh my gosh! I cant believe I left that out. Cook on High. I am sorry, but thanks for pointing that out! You never left out the tempeture, It is right there in the recipa. Cook on high 2hrs. to 2hrs. & 30. minutes. Can I use a disposable pan as long as it fits as well? Ester, I am leaning towards yes you should. Are you talking the metal pans? Okay, I went out and looked at the store at the Foil disposable cooking pans. These should work just fine. I have used foil itself in the crock-pot and have used glass jars and both came out just fine. The 8in foil one fit tightly in my round crock-pot and the oval one I have. So that would work, but you wouldnt be able to remove it easily. A rectangle one would work. It also saves a lot of energy cooking in the crock-pot vs cooking in the oven as well, which saves you money. I can’t answer the low vs high, when Lady Katie gets back I’ll have come on over and answer. Cooking dessert in the crock-pot can help in many ways. If you have a gas stove, you are using electricity instead which can be cheaper. Your crock-pot can be used to make the dessert while your oven is cooking the main course. And it is a way to “wow” your family as I did when I said “this was cooked in the crock-pot. lol. I cooked it on high. I would say yes you could cook it on low. you would have to at least double the time to 4 hours to 5 hours total. If you do cook it this way, let us know what happens. The next one I make I definately will try this and see how much time it would take. 2. I don’t recall what the temperature is of a low setting on a crock pot, but theoreticlly, you should be able to cook the cheescake on low and it will be even creamier. Thanks Susan for the great information. It is great to know that low will net a creamer cheesecake Now to plan my next one! What are the benefits of cooking it this way? As you can tell I don’t crock pot much. There are lots of great benefits! 3. if you have a gas stove, you arent using gas. Which in my area is more expensive then the electricity. Saves me money. 4. As far as regular food cooking (dinner), there are many recipes you can load and go. You can leave them in the crock-pot to cook for longer periods of time and not worry about having to be right there to make sure they do not burn. The newer crock-pots have timers on them so you can start or stop at a certain time. 5. There is nothing like putting a lovely dessert on the table and everyone “eewwing and awwing” and then they think you are god when you say “all from the crock-pot. 6. You do not have a working stove and want to make food you normally would cook in there in the crock-pot. A crock-pot can be cheaper than a new stove. My favorite benefit to the crock pot is that you can start dinner in the morning and it’s ready at dinner time. I usually put everything together at night and drop the crock in the pot on my way out the door to work. Slow cooker liners make it all the better! I came across your crock-pot cheese cake recipe that was passed around on facebook. I’m not a big cheesecake fan, but have family that is, so i look forward to making & trying it. thank you. A crock-pot can be used for just about anything. I am glad you had at least a BBQ to cook with when your oven went out. I have cooked cookies, cakes, breads, and brownies in the crock-pot. I love it. That is so cool that you were able to bake on your grill! LOVE IT! how many servings does it make? Depending on how big you slice the cheesecake, 6-8 maybe 10 if you go for a smaller slice. They are fairly thick as you can see by the picture. Think you could add chocolate chips?? oh definately!! after you get the basic recipe in (after the eggs are mixed one by one), toss in your chips and give it a mix and then put it in your pan. Or if you just wanted the chips on top, I would cook it for a little then add them on top. I am planning a baby shower and was wondering if you could cook this in baby food jars? I would think so. You would really have to watch the time on it as it would be less than a full size cake. I have done bread in a ball glass canning jar in the crock-pot before so I know the glass portion should be okay. Let me know how it turns out if you do it! So did you do this in one of those wide oval crockpots? My crockpot is an older round one and there’s no way a pan big enough for this cheesecake would fit inside. Maybe one of those 6 inch cake pans at best, and that would be tight. It looks fabulous though! The one I used is oval and it was in an older oval 6qt. And definately, it would be hard to fit yours. A 6in would be your closest best fit. Is there anyway you could post more pictures of the step when you put the pan inside the crockpot? Scarlett, I posted two pictures in the Cheesecake post itself (at the bottom). One is of the bowl I used (any cooking typ pan, bowl or glass pan that can be used in the stove will work). The other is the bowl sitting in the crock-pot. Sorry no cheesecake in the bowl! Hopefully this gives a clearer picture of how I did it. If not, let me know and I will try to take more! Thanks for posting! Sounds great! Made this tonight and it was wonderful! The hardest part for me was getting the pan out of the crock pot. I used an oval stoneware dish in my oval 6qt crockpot. Took a couple of extra hands, but we got it out and I served it w/ raspberry sauce and/or chocolate sauce. Delish! Glad you had some extra hands! Raspberry and Chocolate sound yummy with it!! I love finding a way to make dessert in the crockpot. This looks fabulous. Could you cut this recipe in half? Does it still have the same results? I have never had an issue with cutting a recipe in half, but know that sometimes it can cause a slight variance in the results. Do you think I could use this cooking method with any cheesecake recipe? Also, did the crust firm up or was it soggy? Hi! Yes you could use the water bath method on any cheesecake recipe you decide to make. And the crust turned out just perfect. Not soggy at all and not too hard. Oh, I am totally going to make this. I have some pyrex little 2 cup bowls that I think I could use too, but I think the first time will be in a nice oval baker dish I have. Perfect! Saw it on pinterest! This cheesecake look’s so fluffy and yummy! I am super psyched to try this in the crock! And thankyou soo much for these wonderful crockpot recipe’s! 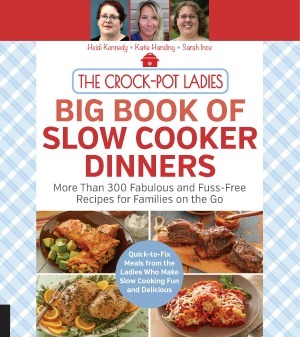 Back in the old day’s ha, when you’d buy a crockpot book, you’d get maybe a couple descent recipe’s. Now we can get tried and true recipes from fab cook’s like you! Bravo! Baked in crock-pot in 8″ spring-form pan raised on a trivet. 2 cups of water evaporated to 1 2/3 cups after 2 hours on high. I had thought about setting the pan in a baking bag as I had used that method before in a hot water bath cheesecake. That way, no soggy crust, but the trivet raised the pan just above the water. I don’t have traditional slow cooker (crockpot). I have a west bend where the cooker basically sits on a griddle/hot plate base. No heat surrounding the sides. The sides get hot like when you cook on a burner. Do you think the West Bend would cook this cheesecake? Any modifications? Georgia, I personally have never cooked with a West Bend cooker. But, from the way it looks, it should in theory work the same way. The only way for sure is to water bath it and go for it! Ok, I’ll work up courage to try it. It almost makes me think it could be “baked” on top of the stove on the lowest setting – maybe put it in a pan and then into a dutch oven and “bake” it. I used my rival crock-pot. Is yours an older crock-pot? I am sorry it isn’t working out. I am not sure what went wrong? did the water evaporate out of the bottom of the crock-pot? No, there was a decent amount of water in it. After 4 hours I finished it in the oven. Oh well…they all can’t work out! I am making this cheesecake now and its going on 3 hours it just dosent look like it going to be done anytime soon. my crockpot is a Rival. its getting late im getting sleepy not sure what to do!!!!!!! How old is your Rival crock-pot? Was the lid on? did it ever finish? I am not sure what went wrong…but maybe more details would help. I can’t wait to try this one!! I made this the other day and it was the best cheesecake I have ever made!!!! It took alot longer to cool than I expected so make it early in the day or let it cool over night. Definitely worth the wait. It came out creamy and delicious! Could you do this in individual mason jars and put the jars into the crockpot? Hi Megs b. I think you can! I think that is going to be an experiment we are going to have to try! I love this recipe, I’ve been craving cheesecake and this is so simple. and I definitely love a thick cheesecake. My only problem is, my crock pot is a dorm sized crock pot, probably big enough to only make one serving of cheesecake. Is it possible to just put the cheesecake mix in the crockpot instead of putting it in a bowl within the crock pot? I do not think it will turn out the same if you just put it in the crock-pot. 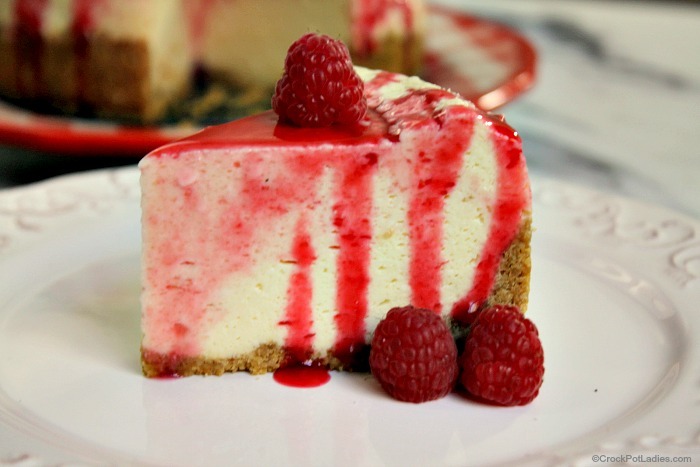 The water is important to the cheesecake to give it its moist thick texture. The only thing I can suggest for a smaller crock-pot is use a smaller oven safe container. I am not for sure where you could find one though. this looks amazing!! 🙂 found you from Eat at Home ingredient Spotlight! WHAT DID I DO WRONG?? Mine totally fluffed up and poured over the sides?? It was a soupy/gelly mess??? Why why why? Guessing here, but two things come to mind…how full was your pan? or did it overcook? I know the second time I made it, I went just a little over and it puffed up. I was able to take it out and refrigerate it and it turned out fine. The only other things that might of happened, when adding the eggs did you add an egg and then mix well, then another egg and mix? Totally guessing but trying to help by figuring out what might of gone wrong. Could you post pics of your crockpot cheese cake & also use cola or a few drops of food coloring to show the water! Thanks. I love seeing step by step pics! The post has a picture of the cheesecake I made. Do you want the cola in the cheesecake?? I am not for sure how that would taste…hmmm might have to check into that. If you look at the thin mint cheesecake, I used green food coloring on that one. Turned out great! Sorry, I didnt see the part about the water. Lol. The next one I make, I will definately use food coloring to show the water in the pot. I have to get thru easter first without eating too much candy to make another cheesecake though! I made this yesterday with chocolate graham crackers for the crust..it was really tasty! thanks for some great recipes! Chocolate graham crackers crust! yum!! Just for posing as a pic…u don’t have to make the cheese cake with cola….just to show depth of water in crock pot! Does that make sence to you? This was a really easy and good cheescake recipe. I thought it needed a bit of vanilla, though, and I had to reduce all of the ingredients by a third so that it didn’t overflow in my pan. I will make again, for sure! I made this cheesecake over the weekend and it turned out very yummy! I would like to note that I lined a 7 inch Pyrex glass bowl with foil to allow easy removal. The next time I make this I will not fill the dish as full because I had a little over-flow and I eneded up having to increase the cooking time by 30 minutes. Still, a fabulous find! Thanks for sharing. Now that our family has shrunk to two, I often put a pan in my crockpot to make a smaller amount. I have made foil lifters to make it easier to get the dish or pan out. Use heavy duty foil to make a strip that is long enough to go down the inside of your crockpot, across the bottom, and up the other side with an ample amount hanging out over the sides. Just tear off a piece the length you need and fold it several time to make a sturdy strip. Make at least two of these. Before you put the filled pan in the crockpot, put in the foil strips crossing at right angles. Set the pan in and cook as planned. To take out, just carefully fold the strips over the top to form a handle for your hand to lift it up. This is so easy to make and do and so hard to explain! Hope it makes sense to somone. I just discovered this website and am excited by all the great recipes! Using heavy duty foil to make handles to lift out the baking dish is a great idea, Rosie! I especially like that it allows me to use a larger size baking dish, as I won’t need to leave as much room around the sides for my fingers when lifting. Thanks for the great sounding recipe! I can’t wait to try it! I made the recipe and followed it exactly. The cheesecake was too creamy – no texture whatsoever, and it tasted a bit “eggy”. I am not sure why this happened. Can anyone help? I did find a small round 6″ springform pan and it worked great. The only thing I can think of is when you added the eggs. You might not of mixed the egg well enough before adding the next egg. But this is a guess. Thanks for the advice! I’ll do that next time. I use these organic very large eggs and the yolks are dark yellow from all the omega 3, etc that the hens are fed. I may cut back one egg yolk next time. Just a note that I tried it again with 2/3 the recipe as I think my pot was too small and it overflowed. It turned out PERFECT! No cracks, no nothing!!! Will totally do again!!!! Thanks Terry, so glad it came out awesome for you! Substitute Splenda for the sugar and chopped pecans for the graham cracker crumbs and this is a LOW CARB recipe for dessert! Do you think a glass pyrex bowl would work as the “crock bowl? Oh! I read through all the comments & see that you wrote about any glass/microwave safe being okay. Now I’m wondering if I’ll have to change the cook time..? No using the glass pyrex should not adjust the time by much. I would definately look at the cheesecake at 1 hour and then 1 hour and 30 minutes to see how it is doing. You should be able to see it without removing the lid to the crock-pot. yes you can use the glass pyrex bowls. Must try this SOON! I use my crock pot a ton, but never thought about making cheesecake. With fresh strawberries in season, this is perfect timing to find your blog. Made this last night, first time making cheesecake and first time using a crock pot, it was deliscious, added some fresh picked strawberrys on top <3. Thank you. I have shared this recipe with lots via pinterest- it is the only way I will make cheesecake from now on! Love it!!! So how would you alter the recipe if you wanted pumpin cheesecake or any other “specialty” flavored cheesecake? You can make any cheesecake recipe you want in the crock-pot. Just make sure you have the water in the bottom and the cheesecake in some sort of pan. i learned on “semi-homemade” a few years ago, when cooking with a crock pot, sandra would put several paper towels across the top right under the lid to absorb the steam. i have used this tip several times when cooking chowders that i didn’t want the steam to dilute the cream based soups. this idea would work here… it would keep you from looking through the lid though. Not having a large crock-pot…and only being the two of us, I divided the recipe into 3rd’s (very easy – 1 cream cheese, 1 egg and 1/4 cup sugar) It was perfect!! So good and just the right size. I made it in a tall cereal bowl. Mary that is great! can you post the exact amounts of cream cheese and other ingredients? Many have asked if you could do this smaller. Or submit the recipe and enter our monthly recipe drawing!! For the smaller cheesecake I used 1 8oz cream cheese, 1 egg and 1/4 cup sugar….just mixed the same as for the large. For the crust, I just smashed up some Lorna Doones and a tsp or so of butter…It was so yummy! How long did you cook the little cheesecake for? Where do you get the bowl to put inside the crockpot? the bowl I used was one that came from my grandma…but any glass crock-type casserole could be substituted. These recipe proportions worked great for a 7″ round aluminum pan purchased at a local dollar store. I made three large balls of aluminum foil for it to rest on while cooking and only put enough water in to come to the bottom of the pan (about 3-4 cups). I don’t recommend putting paper towels under the lid because mine sank in the middle and stuck to the cheesecake. The crock pot I used had a high setting that was way too hot and the cake curdled 3″ in from around the edge after a little over 2 hours. I’ll try the low setting for 4-5 hours next time. Okay so I am trying this RIGHT NOW only I have no idea how it’s going to turn out. I have 2 crock pots- one is missing a foot the other is missing the insert bowl (it cracked and broke). I DO have a 22 quart Oster Roaster which is the closest I have to a crock pot. I preheated it on high (450 degrees) and put in about 3-4 cups of water because of how big it is. I made a larger cheesecake because we have 7 kids, so I used a large baking stone and added a whole package of graham crackers. I figured I should turn it down to about 325-250 degrees if that, haha! Update: I purchased a small $5 pyrex bowl for the second time around, added water until halfway up the pyrex, and cooked it on low for 7 hours with lid slightly open (bowl size is 4 C/950 mL, perfect for this recipe). It set well and there was no curdling but it wasn’t as “done” as I would like and was a little gooey. I’ll try it a third time with the pyrex dish, on low again, with the lid completely on for 4 hours (or maybe I’ll be brave enough to attempt the high setting but watch closely for curdling). I should have realized earlier that pyrex would insulate better than aluminum and probably prevent curdling. I used a 7 cup Pyrex bowl and used 2/3 of the ingredients. After 2.5 hrs on high it still had a spot that looked a little watery so I gave it another 15 min and it looked better. It was very good and so much easier than any other cheesecake I’ve made! I can’t wait to try it again and add some other flavors. Thanks for the great recipe! Can’t wait to try this, LOVE Cheesecake. Kinda scared after reading alot of the comments though but I’ll give it a try. I baked this cheesecake in the vintage Bread-n-Cake Bake pan for the 5 quart Crock Pot. The cheesecake turned out great and is very yummy. I was expecting it to be extremely difficult to get out of the pan. After slicing it, I removed the slices from the pan without too much effort. This cheesecake tastes even better if refrigerated overnight. As I was on Pinterest, I came across this recipe. I had to give it a try. I followed your directions exactly and the cheesecake turned out fantastic! My family loved every bite. I am now hooked on crock pot recipes. Thanks so much for sharing your creations. The pan I used for setting into the crock pot was the 8″ round cake pan I had bought from Michaels for my cake decorating classes. It worked perfectly. I love this idea and want to try it asap. Great! Took the 2 hours but only used a third of the ingredients since I was afraid it would over flow if I used it as written. Made a perfect portion for 4 small pieces. I used strawberries on top and chocolate graham crackers. I will be messing with this more. Thanks for sharing! Put some food coloring in the water. I so love this recipe. I am going to try it. Thanks for sharing!! You don’t even understand how amazing this looks to me. I had no clue you could make something so spectacular in a Crock-Pot! what about making it in the oven? how many hours to bake? I am not sure as I have never made a cheesecake in the oven. Once you do it in the crock-pot you really dont want it any other way. Normal conversion for the oven is half the time of the crock-pot so maybe 1 hour? but that is just a quess. use just enough graham crackers to make a dry pie crust. The butter will make it just sticky enough to form. I am thinking maybe a cup and a half. as far as a dish, do you have a glass bowl that will fit? or even a baking dish like a bread pan? I tried this for the first time today. Everyone loved it! I actually replaced the sugar with Splenda and used lowfat cream cheese. I have a 7qt oval crockpot and used a 1 1/2 at Corningware dish which is about 3″ deep. I originally thought it would be a very small cheesecake, boy was I surprised! I forgot to mention that I used a butter knife and ran it around the edge. It popped right out of the dish. THANK you for this recipe. Did it last night. Cut recipe down by 1/3 as I didn’t have a big enough container to fit into the crock pot, used very low fat cream cheese, added lemon zest, used digestive biscuits as graham crackers are sadly unknown outside of the States. It was brilliant. Took 2 1/2 hours, let it cool, put it in the fridge overnight and served it for breakfast with homemade strawberry coulis. Magic. When you say sugar what kind do you mean – White granulated (caster) or fine powdered (icing/confectioner’s) – would really like to make this today but don’t want to get it wrong! regular white sugar. let us know how it turns out. Hey Miranda, you would use granulated sugar in this recipe. Is there something I can use instead of eggs? I’m allergic. Fold 2 long pieces of foil 4 times on the long side, put them into the bottom of the pot forming an X, and draping the lengths over the sides. Follow the recipe. When the cake is finished, use the foil as ‘lifts’ to take the cake out. I was just wondering if this could work in a Dutch Oven in the oven, and if so what temperature you might put it at? about 6-8. depends on how big you slice it. This is my new favorite dessert in the WORLD! It’s so easy and it turned out perfect. The first time I made a plain one. The second time I added pecans and chocolate chips and split the batter into individual size pyrex bowls which only took about an hour to cook. Once they were done I drizzled them with chocolate and caramel. So Good! hi can you tell me what sort of sugar you used? In the uk we have caster sugar, granulated, and icing sugar. im making this now. Unfortunately, i didnt read the comments before hand. I’m fairly certain i filled the cheesecake too high. It never occurred to me tgat this would fluff up oh well… maybw I’ll try scooping some out. Thanks for the recipe! I made this exactly as instructed. I cooked it last night and let it refrigerate for almost a day! Christmas dinner wound upbringing late. It was perfect! I used a rectangular glass Pyrex bowl. My boyfriend loved it! I never would have dreamt I could make a cheesecake but now I can 🙂 Thanks for sharing such a great recipe. Okay so I am having a hard time getting any of my pans to fit in the crock. Could you use the oven? And if so what would I need to do/ what temperature/ and how long? Thanks! I was wondering if you could this recipe in the oven? If so, what temperature and how long? And would I have to do anything else to the recipe? Thank you! Erica, I am not sure about the oven and times. Normal oven conversion is 2x as much for the crock-pot. So if it is 2 hours in the crock-pot, it would be about 1 hour in the oven. 350 degrees = high. With that said, I have never had luck making this in the oven. But if you do, the recipe is the same as what we have. I would start at 30 minutes and check it til it is done in the oven. Another posted said that if you put a pan of water in the oven, the cheesecake comes out perfect. something to think about. Let us know how it comes out! Did you preheat the crock pot before putting in the cheesecake? When cooling did you just turn it off and leave the cover on? Or did you remove the small bowl from the crock pot and remove the cover? I did not preheat the crock or crock bowl itself before adding in the cheesecake. Once the cheesecake is done cooking, remove completely from the crock-pot and let cool. If you do leave it in the crock-pot itself, it will continue to cook. I made this today. It looked fantastic (just like the pic) when I took it out. However there is NO flavor to it whatsoever. None? I am sorry you feel that way. This is very similar to most any other cheesecake recipe. We have had lots of people enjoy it and comment on it. In order to see what may of happened , did you deviate from the recipe at all? What type of crock-pot are you using? I am not sure what happened if you followed the directions. Did you refrigerate it after cooking? Was it too runny and maybe just needed a little longer time cooking? Did the top of the cheesecake form just a little toughness (not a crust so to speak, but not liquid) when it was done? What type of crock-pot did you use? how old is it? About how many cups or capacity does the inner bowl need to accommodate? Awesome recipe. Can’t wait to try it. Just a thought for you, when you said you tried to take a picture of the bowls in the water but the water didn’t show up, maybe add some blue food color to the water next time? Thanks for the recipe! dorm. After you gain some experience, you can begin to improvise with chicken or beef broth, wine, tomato juice,etc. Just a couple of hints…If you are worried about the amt of condensation you can place a dish towel over the top of the crock b/4 you put the lid on. And for the step putting the water in the crock? Adding a little food coloring or a colored beverage such as Kool-Aid gives a contrast so you can see it. Thank you for an awesome recipe. If it will go in the crock pot, I will find a way to get it there! Oh that sounds so delicious! We only have a 4 quarter crock pot and I´m afraid that´s too small? To be exact, I´m in Germany, we have a 3,5 Liter crock pot, that´s even a bit less than 4 quarter. Anyways….I don´t have a bowl or an pan that woul fit in the crock pot and even if I had, it would be too small right? you definately need something that can fit inside of it so the water does not get into the cheesecake. The water helps with the texture of the cheesecake. how big of a dish do I need for the cheesecake ? the dish I used was 1.5 quart. This was pretty good, turned out better than I was expecting! I would make a couple changes though I thought it was odd that there wasn’t any sugar in the crust so I added a tablespoon but next time I will add more sugar, and subsequently more butter. Also would add some vanilla extract to the cream cheese mixture for some extra flavor, but this is a pretty good base. Thank you for sharing! It is definately the basic recipe. You can swirl in chocolate syrup or some strawberries or even cherries. Add in some raspberry flavoring or a layer of chocolate after the crust. Your choices are endless. Pumpkin Cheesecake is another good one…and lemon! It is those like you that we try things that normally wouldnt go in a crock-pot. I have cooked just about everything in it and found what works and what does not so much and how to turn it around a little to make it better. Love this recipe I have made it a handful of times and its always delish!! Random question… Is it possible to make the same recipe in a oven?? I need to double to recipe and would like to use a 9×13 pan and obviously my little crockpot just won’t do the job. What would you recommend?? Thanks!! yes it is possible. 350. but time was i am not sure about…normally time in a crock-pot is double what it would take in the oven. Still do the water bath as that adds to the taste of the cheesecake. I have nesting crock pot bowls (2, 4 & 6 QT) can I use the largest and fill with water and then stack the smallest on top? I would think so. watch the time on it , it might take longer. PUt the water in the larger crock-pot bottom and the lid to the large one on top of both. How do you keep condensation online from getting on cake? How do you keep condensation from lid off the cheesecake? a paper towel put between the lid and the inside. Some use a kitchen towel. that will absorb the extra moisture. When you cool the cake, do you leave it in the crockpot with lid off or take it out completely? take it out. if you leave it in, it will still cook. After the cooking time, do you just turn off crock pot and let the cheesecake cool in the crock pot? Or remove the bowl and cool on counter? Angie, remove it from the crock-pot. Otherwise, it will continue to cook. I set it on the counter and once it cools, put in the fridge to set it. I made this today and mine turned out like a custard. The crust turned out fine. Did I cook this too long or not long enough. The cake mixture puffed up to the top of the pan but not over, the water didn’t get into the pan either. I did put it in the fridge to cool as well. any tips on my mistake? how did you mix the eggs? usually a custard like cheese cake is because of the eggs. Either they were added together, or beaten too much or too little. Stopped by to see if you were doing the link up party and this caught my eye! 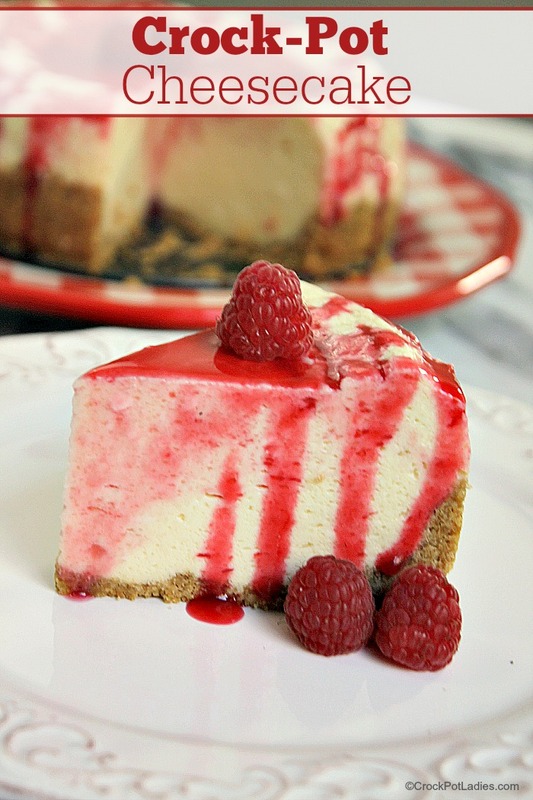 I must try this Crock Pot Cheesecake Recipe! Hi Billie, the link party is up! And this cheesecake recipe is the bomb diggity! Hi! I am actually in the process of making this right now! Im not sure if you even check this anymore since its been 2 years since the last post, but I had a question! I am using a corning ware round bowl, and it doesn’t sit all the way in the bottom of the crockpot. However, it is in the water and and catches on the back and front. Is this still going to cook, or does it need to be touching the bottom of the crockpot?? it should work just fine. and we are still around. we post new recipes all the time. Step 16 says to cool for 30 minutes. Is this inside or outside the crockpot because Step 17 says to remove. Is that remove from crockpot or pan it was cooked in? let cool in the crockpot for 30 minutes, then remove from the crock-pot. I’m super late to the commenting party here, and didn’t read all the comments, but here’s my experience…I’ve cooked this twice now, and the first time it turned out really eggy. I followed the instructions exactly, but it wasn’t amazing. I used large eggs and had to hand mix it. I also had to cook it longer than you stated. This last time I did it, I used medium eggs instead of large eggs, and used my KitchenAid to mix the ingredients. I also cooked it closer to 3 hours. It turned out amazing! I’m actually making another one today because my daughter can’t get enough of it, lol. I have a 1.5 quart crock-POT. Can I use this as the dish to make the cheesecake in? It would fit inside my large crock-pot. Love this cheesecake. The only change I had to make was that I had to cook it for 4 hours in my crockpot. can I use individual mason jars instead of pan? While we have not tested this particular recipe in mason jars it should work. Do you put the big bowl in a crock pot? I don’t get it. So you put the big bowl in a crock pot and then put the small bowl in the big bowl? And would you cover it while it’s baking? I just discovered your site and I will be exploring it further….. Looks like you have some great recipes here….. I notice that you have a print button but it does not print the picture with the recipe. When I look at recipes down the road, I rely on pictures for inspiration….. Is that something you can incorporate in your printing options? Hi Linda, Thanks so much for your comment. The print feature is designed to allow you to print just the recipe without the photo so as to not waste printer ink. If you want to print the photo(s) as well may I suggest either using Print Friendly which will allow you to select the elements from any web page that you wish to print. Or Evernote which is what I personally use to store and organize all my recipes that I find on the internet. Evernote allows me to clip recipes from any website, organize them, view them on my iPhone or iPad, print them, give them tags (like “the kids really liked this one” or “quick and easy”). I really need to write a tutorial on how to use Evernote for storing and organizing your recipes….maybe someday! Either one of those should work great for you. In the meantime the print feature here at CrockPotLadies will probably continue to just print the recipe without the photo because we hate wasting printer ink ourselves (that stuff is expensive!) and that is what most of our readers seem to prefer. My husband and I tried this in our smaller crockpot twice already with a 6-inch cake pan but cut the recipe to 2/3rds to fit. We even decorated one with a guinea pig face in order of my sister’s birthday (she has pets). It was awesome both times! I would love to see the decorated one with the guinea pig! Post pictures next time. I am glad that you enjoyed the recipe Angeli! Thank you and Welcome! I see you like pumpkin pie …how about pumpkin cheesecake! .